The sensor used in this experiment is pretty sophisticated. The BME280 reads barometric pressure, temperature and humidity. It can even extrapolate altitude based on pressure changes! It communicates all that data to the Tessel 2 using a serial protocol called I2C (Inter-Integrated Circuit) protocol. This sensor has built-in support in Johnny-Five using the Multi class. I2C is a popular serial protocol; it shows up all over the place in digital electronics. The design of I2C, with a shared bus, takes far fewer wires than other serial options (e.g., SPI, which we'll meet in a future experiment)—especially when hooking up multiple devices. You can (theoretically) connect up to 1008 different devices to the same two pins and use 'em all at once. Got a C or Arduino background? To work with I2C sensors, you'd normally have to work with device-specific libraries written by others (or maybe yourself!). But in Johnny-Five there are a number of I2C sensors built right in to the framework—the heavy lifting is done for you and the low-level details abstracted out of your way. 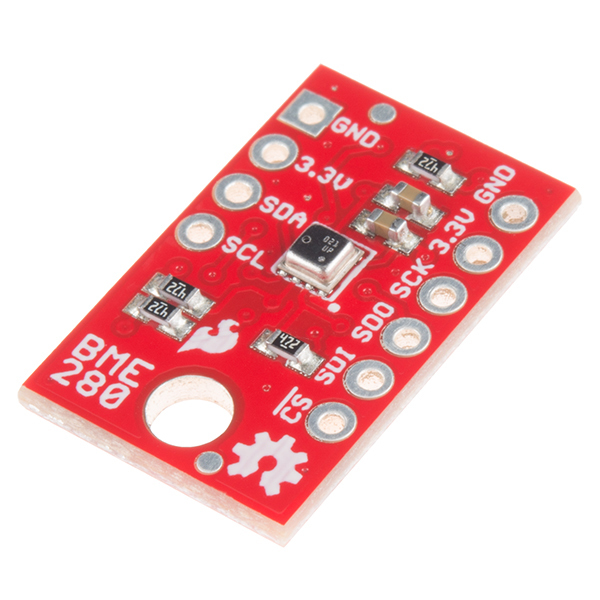 The SparkFun BME280 Atmospheric Sensor Breakout is an easy way to measure stuff about the atmosphere around you: pressure, humidity and air temperature. All of this is combined into a petite package, called a breakout board. The 3.3V breakout is power-efficient, using as little as 5µA (that's 1/1000000 of an amp!) when idling and less than 1mA when it's taking measurements. There are 10 pins on the breakout board, but six is the maximum ever used at one time. In this experiment you will work with the BME280 to read the temperature, pressure and humidity of the room as well as your altitude based off of the atmospheric pressure. Finally, in the Building Further section you will use your BME280 as the heart of a web-based weather dashboard application. Is it hot in here, or is it just me? Let's find out using this sensor, but first you need to hook it up! Compared to the H-Bridge motor circuit in Experiment 9, this one is pretty simple. Attach the BME280 breakout board to the breadboard so that it spans the center notch. Connect the BME280's SCL (clock) pin to Tessel 2's Port A, Pin 0. 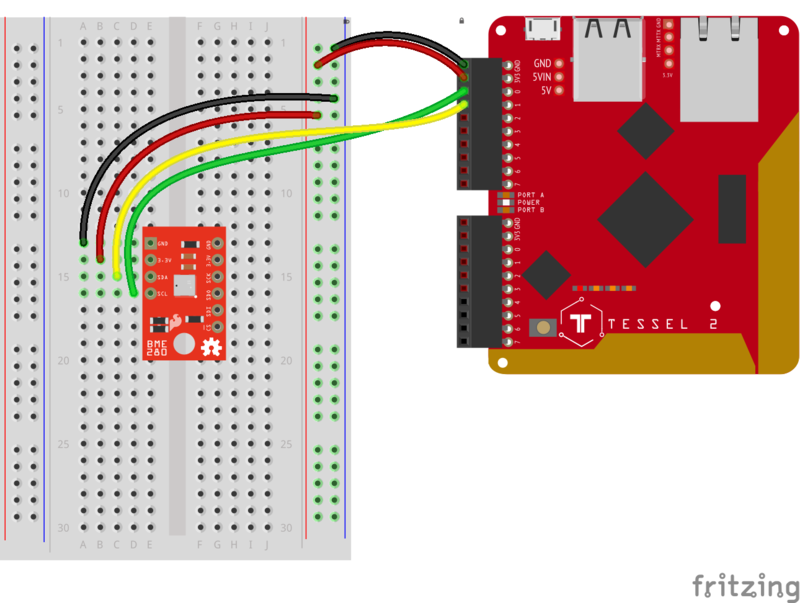 Connect the SDA (data) pin to the Tessel's Port A, Pin 1. Connect 3.3V to the Tessel's 3.3V pin and GND to GND. Note: For programs that output a lot of data quickly to the terminal such as this one, we recommend deploying your code over LAN for best results. Make sure that your Tessel is provisioned and shows up in your list of Tessels using t2 list. See the Hardware Installation and Setup for how to provision your Tessel if it doesn't show up in your list. This is going to print a lot of data to your console, very quickly—so quickly that you likely won't be able to make sense of it! Go ahead and exit the program by typing Command-C or Control-C.
Once the board has emitted the ready event, hardware inputs are ready for interaction, so the first thing that occurs is an instantiation of a Multi object. Multi objects represent two or more components, usually sensors, that are packaged together and exposed via a single register. Multi and IMU (Inertial Measurement Unit) boards that combine multiple movement sensors like accelerometers, gyroscopes, etc.) are very similar; the latter is used for non-motion-related packages. ... which is a lot of data and will likely overwhelm the terminal, so be ready to type Command-C or Control-C to end the program. Now that we've demonstrated the basics of using a sensor package like the BME280, let's make something interesting! The next sections will guide you through creating a web application that displays all of the data from the BME280 as nice-looking gauges in a browser. The data updates automatically because we will use these snazzy things called Web Sockets — basically there will be no need for you to refresh the page! Install some needed npm packages. Deploy and run the program on the Tessel 2! Note: You can install more than one package at a time with `npm` by separating the package names with spaces. Once npm packages are installed, create a new subdirectory called app/ inside of your j51k directory. Back in your j5ik directory (not in the app subdirectory), create a new file called .tesselinclude. // it from the recipient set. There will likely be additional files in your j5ik/ directory from other experiments in this guide, but make sure monitor.js and .tesselinclude are in the j5ik/ directory and that index.html and main.js are inside of j5ik/app. Once the program is bundled and deployed, a URL will be displayed in the terminal. Copy and paste the URL into a browser address bar and press [ENTER]. Click on the diagram for a closer look. There is certainly a lot more code in this experiment than in anything we've previously looked at! A web server configured in monitor.js serves HTML (index.html) and JS (app/main.js and a few others included in index.html) to the browser. monitor.js starts out with several require calls, as we bring in our dependencies. The first new dependencies are the built-in—meaning that they come with Node.js and you don't have to npm install them—http, os and path modules. We'll see these again as we go. Huzzah! Now we have the beginnings of a web server. All of that boilerplate completes the setup of a fully functional HTTP server with simple routing and an Active WebSocket. Yay, Node.js! Just before we proceed with registering the ready event handler for the board object, we need to set up some basic routing for our application's HTTP requests (that is, when we visit our monitor app, this will tell the server where to find the content to deliver). The first line tells the server to serve up static content. It will treat the app directory as the web root and respond to a browser request for /index.html by delivering the file at app/index.html. The second line makes the content in the local node_modules directory available as the URL path /vendor (e.g., a browser request for /vendor/justgage/justgage.js will result in the delivery of the file at node_modules/justgage/justgage.js). Once the ready event is emitted, a new variable called clients is created, whose value is a new Set instance object. While Set may seem much like Array, it's got its own thing going on. You can't put the same thing in a Set twice. You can't access entries in a Set using a numeric index like you do with Arrays. You can only access stuff in a Set by iterating over the Set in order. You can't change the order of things in a Set once they're there. Lest that sound like a lot of rules and "can'ts", Sets are great when you do want to iterate over things in order, and they have intuitive methods for getting stuff done. This clients Set will contain a list of unique connections to our server and allow the program to limit the number of connections to 5. Turns out 5 is a totally arbitrary number to limit connection demands (the more active clients, the more resources the program will use). Nothing goes in the Set just yet. Next, we create a new instance of the Multi class. This time we're setting a baseline elevation, in meters, which can be obtained by visiting whatismyelevation.com/. This will give us a relative altitude from our current elevation (in meters). If you don't set this value, the sensor will display relative altitude from the point of the first pressure reading—you'll be starting from 0! We'll need to respond to changes from the monitor (changes to the values of any of its sensors) and tell all of the connected clients about that so that the freshest values can be displayed. We can do that by triggering (emit-ting) a report event. There's a small wrinkle to this: emitting a report event causes the gauges displayed on the web page to refresh and re-animate. Doing this too often causes browser performance woes. So we'll throttle the report events to happen, at most, every five seconds (change events fire pretty frequently). That's the purpose of the updated variable—to keep track of the last time a report event was emitted. Are there fewer than five clients already connected? Good. If so: a. add that client (socket) to the clients Set. b. When that new client (socket) later emits a disconnect event, remove (delete) that client from the clients Set. That frees up room for more connections. All right! Time to kick our web server into gear. That'll make the server listen on port 3000. It'll also helpfully log the URL for you so you can view it from a browser (on the same network, anyway). Respecting the great circle of life, the server also needs to know when it's time to die. It listens for a SIGINT (SIGnal INTerrupt) on the process object (which represents the actual software process). That is: when the program's process stops running, close the server. 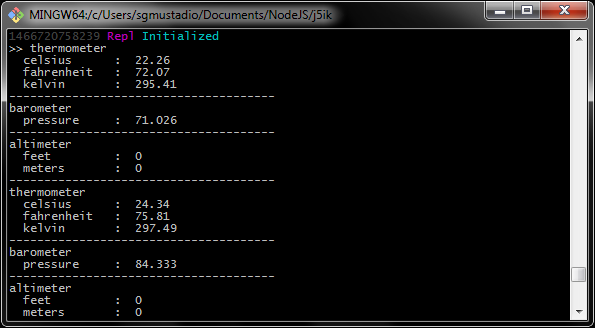 Then we're creating new JustGage objects, stored in a monitor object. The options passed to JustGage define details about the gauge: its appearance, range, etc. Build a home-monitoring app with Blynk -- Have your phone interact with your Tessel 2 to monitor the temperature and humidity in your home. Report your data to a data-streaming service (i.e. Blynk, ThingSpeak, and Cayenne). For more information, check out the blog post about the Three IoT Platforms for Makers. Log your data to a CSV file using the file system -- If you don't have access to the internet, log your data to a text file using the file system on your Tessel 2.